The French and Indian War (1754–1763) was the North American chapter of the Seven Years' War. The name refers to the two main enemies of the British: The royal French forces and the various American Indian forces allied with them. The conflict, the fourth such colonial war between the kingdoms of France and Great Britain, resulted in the British conquest of all of New France east of the Mississippi River, as well as Spanish Florida. The outcome was one of the most significant developments in a century of Anglo-French conflict. To compensate its ally, Spain, for its loss of Florida, France ceded its control of French Louisiana west of the Mississippi. France's colonial presence north of the Caribbean was reduced to the tiny islands of Saint Pierre and Miquelon. The victory would ultimately prove to be a Pyrrhic one for the British, as the debt it incurred winning the war would lead directly to a series of taxation fights with the colonists that would spark the War of Independence. The conflict is known by several names. In British North America, wars were often named after the sitting British monarch, such as King William's War or Queen Anne's War. Because there had already been a King George's War in the 1740s, British colonists named the second war in King George's reign after their opponents, and thus it became known as the French and Indian War. This traditional name remains standard in the United States, although it obscures the fact that American Indians fought on both sides of the conflict. American historians generally use the traditional name or the European title (the Seven Years' War), and have also invented other, less frequently used names for the war, including the Fourth Intercolonial War and the Great War for the Empire. In Great Britain and France, the North American theater of the Seven Years' War war usually has no special name, and so the entire worldwide conflict is known as the Seven Years' War (or the Guerre de sept ans). The "Seven Years" refers to events in Europe, from the official declaration of war in 1756 to the signing of the peace treaty in 1763. These dates do not correspond with the actual fighting in North America, where the fighting between the two colonial powers was largely concluded in six years, from the Jumonville Glen skirmish in 1754, to the capture of Montreal in 1760. In Canada, both French- and English-speaking Canadians refer to it as the Seven Years' War (Guerre de Sept Ans) or the War of the Conquest (Guerre de la Conquête), since it is the war in which New France was conquered by the British and became part of the British Empire. This war was also known as the Forgotten War. There were numerous causes for the French and Indian War, which began less than a decade after France and Britain had fought on opposing sides in the War of the Austrian Succession (1740–1748). Both New France and New England wanted to expand their territories to enhance fur trading and other pursuits that matched their economic interests. Using trading posts and forts, both the British and the French claimed the vast territory between the Appalachian Mountains and the Mississippi River, from the Great Lakes to the Gulf of Mexico, known as the Ohio Country. English claims resulted from royal grants which had no definite western boundaries. The French claims resulted from La Salle's claiming the Mississippi River for France–its drainage area includes the Ohio River Valley. In order to secure these claims, both European powers took advantage of Native American factions to protect their territories and to keep each other from growing too strong. Newfoundland's Grand Banks were fertile fishing grounds and coveted by both sides. The conclusion of this war would see France keeping only the islands of Saint Pierre and Miquelon, allowing them access to the Grand Banks to this day. The English colonists also feared papal influence in North America, as New France was administered by French governors and Roman Catholic hierarchy, and missionaries such as Armand de La Richardie were active during this period. For the predominantly Protestant British settlers, French control over North America could have represented a threat to their religious and other freedoms provided by English law. Likewise, the French feared the anti-Catholicism prevalent among English holdings. In this period, Catholicism was still enduring persecution under English law. In June 1747, Roland-Michel Barrin de La Galissonière, the Governor-General of New France, ordered Pierre-Joseph Céloron to lead an expedition to the Ohio Country with the objective of removing British influence from the area. Céloron was also to confirm the allegiance of the Native Americans inhabiting the territory to the French crown. Céloron's expedition consisted of 213 soldiers of the Troupes de la marine (French Marines), who were transported by 23 canoes. The expedition left Lachine, on June 15, 1749, and two days later reached Fort Frontenac. The expedition then continued along the shoreline of present-day Lake Erie. At Chautauqua Portage (Barcelona, New York), the expedition moved inland to the Allegheny River. The expedition headed south to the Ohio River at present-day Pittsburgh, and Céloron buried lead plates engraved with the French claim to the Ohio Country. Whenever British merchants or fur-traders encountered the French, they were informed that they were on French territory illegally and told to leave the Ohio Country. When Céloron's expedition arrived at Logstown, the Native Americans in the area informed Céloron that they owned the Ohio Country and that they would trade with the British regardless of what the French told them to do. The French continued their expedition. At its farthest point south, Céloron's expedition reached the junction between the Ohio River and the Miami River. The junction lay just south of the village of Pickawillany, where the Miami Chief, "Old Britain" (as styled by Céloron), lived. When Céloron arrived at Pickawillany, he informed "Old Britain" of the "dire consequences" of the elderly chief continuing to trade with the British. "Old Britain" ignored the warning. After his meeting with Old Britain, Céloron and his expedition began the trip home. They did not reach Montreal until November 10, 1749. The best summary of the expedition's findings came from Céloron himself. In his report, Céloron wrote: "All I can say is that the Natives of these localities are very badly disposed towards the French, and are entirely devoted to the English. I don't know in what way they could be brought back." On March 17, 1752, the Governor-General of New France, Marquis de la Jonquière died. His temporary replacement was Charles le Moyne de Longueuil. It was not until July 1, 1752, that Ange Duquense de Menneville arrived in New France to take over the post. 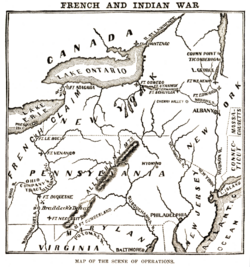 In the spring of 1752, Longueuil dispatched an expedition to the Ohio River area. The expedition was led by Charles Michel de Langlade, an officer in the Troupes de la marine. Langlade was given 300 men comprised of members of the Ottawa and French-Canadians. His objective was to punish the Miami people of Pickawillany for not following Céloron's orders to cease trading with the British. At dawn on June 21, 1752, the French war party attacked the British trading center at Pickawillany, killing fourteen people of the Miami nation, including "Old Britain." The expedition then returned home. In the spring of 1753, Paul Marin de la Malgue was given command of a 2,000 man force of Troupes de la Marine and Aboriginals. His orders were to protect the King's land in the Ohio Valley from the British. Marin followed the route that Céloron had mapped out four years previously. The main difference in the two expeditions was that, whereas Céloron had buried lead plates, Marin was constructing and garrisoning forts. The first fort that was constructed by Paul Marin was Fort Presque Isle (Erie, Pennsylvania) on Lake Erie's south shore. He then had a road built to the headwaters of Rivière aux Boeuf. Marin then constructed a second fort at Le Boeuf (Waterford, Pennsylvania). This fort was designed to guard the headwaters of the Rivière aux Boeuf. On September 3, 1753, Tanaghrisson (d. 1754), Chief of the Mingo, arrived at Fort Le Boeuf. Tanaghrisson hated the French because, as legend had it, the French had killed and eaten his father. Tanaghrisson told Marin, "I shall strike at whoever…" threatening the French. The show of force by the French had alarmed the Iroquois in the area. They sent Mohawk runners to William Johnson's manor in Upper New York. Johnson, known to the Iroquois as Warraghiggey, meaning, "He who does big business," had become a respected member of the Iroquois Confederacy in the area. In 1746, Johnson was made a colonel of the Iroquois, and later a colonel of the Western New York Militia. At Albany, New York, there was a meeting between Governor Clinton of New York and Chief Hendrick, as well as other officials from a handful of American colonies. Chief Hendrick insisted that the British abide by their obligations and block French expansion. When an unsatisfactory response was offered by Clinton, Chief Hendrick proclaimed that the "Covenant Chain," a long-standing friendly relationship between the Iroquois Confederacy and the British Crown, was broken. Governor Robert Dinwiddie of Virginia found himself in a predicament. Many merchants had invested heavily in fur trading in Ohio. If the French made good on their claim to the Ohio Country and drove out the British, then the Virginian merchants would lose a lot of money. Dinwiddie could not possibly allow the loss of the Ohio Country to France. To counter the French military presence in Ohio, in October 1753 Dinwiddie ordered Major George Washington of the Virginia militia to deliver a message to the commander of the French forces in the Ohio Country, Jacques Legardeur de Saint-Pierre. Washington, along with his interpreter Jacob Van Braam and several other men, left for Fort Le Boeuf on October 31. A few days later, Washington and his party arrived at Wills Creek (Cumberland, Maryland). Here Washington enlisted the help of Christopher Gist, a surveyor who was familiar with the area. Washington and his party arrived at Logstown on November 24, 1753. At Logstown, Washington met with Tanaghrisson, who was angry over the encroachment by the French military of his land. Washington convinced Tanaghrisson to accompany his small group to Fort Le Boeuf. On December 12, 1753, Washington and his men reached Fort Le Boeuf. Jacques Legardeur de Saint-Pierre invited Washington to dine with him that evening. Over dinner, Washington presented Saint-Pierre with the letter from Dinwiddie that demanded an immediate French withdrawal from the Ohio Country. Saint-Pierre was quite civil in his response, saying, "As to the Summons you send me to retire, I do not think myself obliged to obey it." The French explained to Washington that France's claim to the region was superior to that of the British, since René-Robert Cavelier, Sieur de La Salle (1643–1687) had explored the Ohio Country nearly a century earlier. The Victory of Montcalm's Troops at Carillon, by Henry Alexander Ogden. The French and Indian War was the last of four major colonial wars between the British, the French, and their Native American allies. Unlike the previous three wars, the French and Indian War began on North American soil and then spread to Europe, where Britain and France continued fighting. Britain officially declared war on France on May 15, 1756, marking the beginnings of the Seven Years' War in Europe. Native Americans fought for both sides, but primarily alongside the French (with one exception—the Iroquois Confederacy—which sided with the American colonies and Britain). The first major event of the war was in 1754. Major George Washington, then twenty-one years of age, was sent to negotiate boundaries with the French, who did not give up their forts. 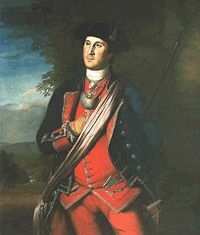 Washington led a group of Virginian (colonial) troops to confront the French at Fort Duquesne (present day Pittsburgh). Washington stumbled upon the French at the Battle of Jumonville Glen (about six miles (10 km) NW of soon-to-be-established Fort Necessity), and in the ensuing skirmish, a French Officer (Joseph Coulon de Jumonville) was killed, news of which would have certainly provoked a strong French response. Washington pulled back a few miles and established Fort Necessity. The French forced Washington and his men to retreat. Meanwhile, the Albany Congress was taking place as means to discuss further action. Edward Braddock led a campaign against the French at Fort Duquesne in 1755; Washington was again among the British and colonial troops. Braddock employed European tactics: bold, linear marches and firing formations. This led to disaster at the Monongahela, where the French and natives, though heavily outmanned and outgunned (the British had a heavy cannon), used superior tactics (using the trees and bushes as cover) to gun down and rout the British. Braddock was killed; Washington, despite four close calls, escaped unharmed, and led the survivors in retreat. This stunning British defeat heralded a string of major French victories over the next few years, at Fort Oswego, Fort William Henry, Fort Duquesne, and Carillon, where veteran Montcalm famously defeated five times his number. The sole British successes in the early years of the war came in 1755, at the Battle of Lake George, which secured the Hudson Valley; and in the taking of Fort Beauséjour (which protected the Nova Scotia frontier) by Lieutenant Colonel Robert Monckton. An unfortunate consequence of the latter was the subsequent forced deportation of the Acadian population of Nova Scotia and the Beaubassin region of Acadia. The year 1756 brought with it William Pitt, Secretary of State of Great Britain. His leadership, and France's continued neglect of the North-American theater, eventually turned the tide in favor of the British. The French were driven from many frontier posts such as Fort Niagara, and the key Fortress Louisbourg fell to the British in 1758. In 1759, the Battle of the Plains of Abraham gave Quebec City to the British, who had to withstand a siege there after the Battle of Sainte-Foy a year later. In September of 1760, Pierre François de Rigaud, Marquis de Vaudreuil-Cavagnal, the King's Governor of New France, negotiated a surrender with British General Jeffrey Amherst. General Amherst granted Vaudreuil's request that any French residents who chose to remain in the colony would be given freedom to continue worshiping in their Roman Catholic tradition, continued ownership of their property, and the right to remain undisturbed in their homes. The British provided medical treatment for the sick and wounded French soldiers and French regular troops were returned to France aboard British ships with an agreement that they were not to serve again in the present war. Though most of the North American fighting ended on September 8, 1760, when the Marquis de Vaudreuil surrendered Montreal—and effectively all of Canada—to Britain (one notable late battle allowed the capture of Spanish Havana by British and colonial forces in 1762), the war officially ended with the signing of the Treaty of Paris on February 10, 1763. The treaty resulted in France's loss of all its North American possessions east of the Mississippi (all of Canada was ceded to Britain) except Saint Pierre and Miquelon, two small islands off Newfoundland. France regained the Caribbean islands of Guadeloupe and Martinique, which had been occupied by the British. The economic value of these islands to France was greater than that of Canada at the time, because of their rich sugar crops, and the islands were easier to defend. The British, however, were happy to take New France, as defense was not an issue, and they already had many sources of sugar. Spain gained Louisiana, including New Orleans, in compensation for its loss of Florida to the British. Also, Britain gained control of French Canada, a colony containing approximately 65,000 French-speaking, Roman Catholic residents. Early in the war, in 1755, the British had expelled French settlers from Acadia (some of whom eventually fled to Louisiana, creating the Cajun population). Now at peace, and eager to secure control of its hard-won colony, Great Britain found itself obliged to make concessions to its newly conquered subjects; this was achieved with the Quebec Act of 1774. The history of the Seven Years' War, particularly the siege of Québec and the death of British Brigadier General James Wolfe, generated a vast number of ballads, broadsides, images, maps and other printed materials, which testify to how this event continued to capture the imagination of the British public long after Wolfe's death in 1759. The European theater of the war was settled by the Treaty of Hubertusburg on February 15, 1763. The war changed economic, political, and social relations between Britain and its colonies. It plunged Britain into debt, which the Crown chose to pay off with tax money from its colonies. These taxes contributed to a series of contentious issues between the crown and the colonists that would ultimately lead to the American Revolutionary War. ↑ Jennings, Empire of Fortune, xv. ↑ Anderson, Crucible of War, 747. ↑ 3.0 3.1 Fowler, Empires at War, 14. ↑ Fowler, Empires at War, 31. ↑ Fowler, Empires at War, 35. ↑ Ellis, His Excellency George Washington, 5. ↑ Fowler, Empires at War, 36. ↑ Collections Canada, Virtual Vault. Retrieved July 20, 2008. Anderson, Fred. Crucible of War: The Seven Years' War and the Fate of Empire in British North America, 1754-1766. New York: Knopf, 2000. ISBN 0-375-40642-5. Anderson, Fred. The War that Made America: A Short History of the French and Indian War. New York: Viking, 2005. ISBN 0-670-03454-1. Ellis, Joseph J. His Excellency George Washington. New York: Vintage Books, A Division of Random House, Inc., 2004. ISBN 1-4000-3253-9. Fowler, W.M. Empires at War: The French and Indian War and the Struggle for North America, 1754-1763. New York: Walker, 2005. ISBN 0-8027-1411-0. All links retrieved November 16, 2013. History of "French and Indian War"
This page was last modified on 11 May 2017, at 14:44.